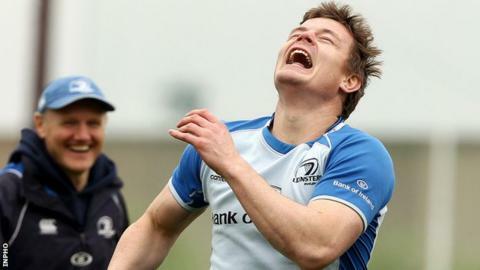 Ireland and Leinster centre Brian O'Driscoll will play for another season after signing a new one-year contract. The 34-year-old centre hinted earlier this month that Joe Schmidt's appointment as Ireland coach could persuade him to delay his retirement. "I want to thank the IRFU and Leinster for allowing me the time to think about my future and discuss my options with my family," said O'Driscoll. O'Driscoll is the second most-capped player in international rugby. The former Lions captain made his senior Ireland and Leinster debuts in 1999 and has since gone on to appear 125 times for Ireland and 172 times for Leinster, scoring 46 international and 59 Leinster tries. O'Driscoll has won a Grand Slam, four Triple Crowns, three Heineken Cups and two Pro 12 (Celtic League) championships. He added: "The support my family and the Irish and Leinster fans have shown me over the past few months, and indeed years, has been phenomenal and I am now very much looking forward to one more year playing with Ireland and Leinster." O'Driscoll was impressed by Schmidt during his time as Leinster coach and reconsidered possible retirement plans when the New Zealander was named as Ireland's new coach last month. ""It's great that Brian has agreed to continue playing," said Schmidt. "He's an inspirational player, not only on the pitch, but also on the training ground. "He's played well again this season and other players continue to learn from him. I know that every squad of which he is a part will profit from his qualities both as a rugby player and a person."